Dr. Johanna Budwig left us in 2003, at the age of 95. This German doctor was nominated six times for the Nobel Prize for medicine, which means that it would be wise to take her health work seriously. We call her a saint, but doctors-in-the-know thought of her as a god. She cured cancer in “terminally ill” patients; even patients which the establishment had surrendered to fate, claimed were “untreatable”, and had given a death sentence to. She did not just cure specific or rare types of cancer. 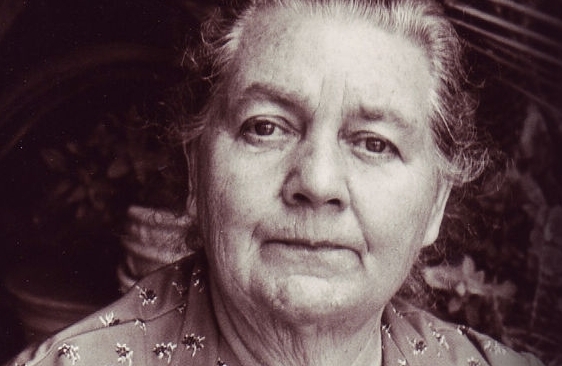 She cured all types of cancer, and she did it relatively quickly, cheaply, easily, and permanently; using only non-toxic ingredients, which had no side-effects. Her medicine actually made her patients stronger, and her cure rate was over 90%, including the worst terminal cases. Dr. Budwig’s successes greatly contrast the fact that the life-long cure rate from standard procedures averages less than 4%, and that the standard therapies themselves are known to cause future cancers. Dr. Budwig’s secret weapons against cancer were quark cheese and flax seed oil. She quickly became enemy #1 to the pharmaceutical and nuclear industries. They have been so effective at suppressing her work, that for many of our readers, this will be their first instance of learning of her Budwig Protocol. Her bombshell findings were first published in the early 1950’s. Yet they are still being censored today in most countries. First and foremost, cancer is not merely an outbreak of tumors. The orthodox establishment apparently considers them to be the same, but it would be a waste of time and space to go there. For now, we shall simply state that endorsing perpetual treatments to create life-long customers is the overall agenda of policy makers, instead of curing. A dead patient is not profitable, nor is a healthy patient. The big money is made somewhere in the middle, in patients who are alive, but just barely. The reason why they will never find a cure is because they are not looking for one. Curing would eliminate the cash flow, and this industry is so profitable that it is the 5th leading cause of bankruptcy in the United States. Any researcher who found a cure would quickly find himself looking for another job, and at some level, all of them know it. Cancer is the most profitable condition in medical history, and the establishment intends to keep it that way. Cancer is essentially a modern man-made epidemic from the food and chemical industries, which tend to be one in-the-same. There is some evidence that cancer existed in ancient history, but cancer was extremely rare in ancient times, except in cities with cases of mass heavy metal poisoning (again, man-made). Cancer is expected to strike one person out of every three born, and this rate is rising rapidly. It is painfully obvious that there is something very corrupt about the industry, when cancer is supposedly treated by the three things that most reliably cause it: radiation, poison, and malnutrition. In fact, properly prescribed medicine is the 3rd leading cause of death in the United States according to the death census (not even counting the mistakes), and the treatments are responsible for most deaths which are attributed to “cancer”, which is the 2nd leading cause of death. Doctors never discuss the real statistics, because in 96% of cases the treatments will greatly reduce a person’s life span, and most patients will not live longer than five years. This data, which doctors keep private is why surveys show that most oncologists would refuse their own treatments if they had a cancer themselves. While well-meaning people continue to walk for the cure, the industry that they are supporting is still murdering their friends for profits. We are hoping to give our readers a greater than 4% chance. Toxins, radiation, and acidosis (from pharmaceuticals and malnutrition) are the unholy trinity of cancer. Acidosis is the final stage of this misunderstood condition. An astute reader will have noticed that these things are caused by the medical establishment itself, even in its supposedly valiant fight against cancer. When a person’s body chemistry becomes acidic from the aforementioned factors or modern medicine, then his blood’s ability to retain and carry oxygen is severely diminished. Healthy individuals have a blood oxygen level of between 98 and 100 as measured by a pulse oximeter, but cancer patients routinely show only 60. Oxygen is replaced in a cancer patient’s blood by wastes such as carbon dioxide. The oxygen starvation caused by acidosis leads to the formation of tumors as cells must mutate to derive their energy from a fermentation process. Normal cells obtain their energy from oxygen respiration, but oxygen-starved cells must mutate for survival, in order to utilize a type of direct sugar fermentation, which is the body’s self defense. This is not as biochemically “clean” as oxygen-based energy, and the waste products of fermentation build in the tissues causing even higher toxicities. This leads to even more acidosis and cellular oxygen starvation. Eventually, the entire immune system is debilitated by the process of cleaning the waste products, so that it can no longer cope with the removal of unhealthy cells. This allows the cancer cells to multiply even faster and to spread unchecked, creating the symptom of tumors, which is in the latter stages of the cancer process. All of the above was proven by Dr. Otto Warburg, and he won the Nobel Prize for it in 1931. His findings were suppressed, and so most readers wil not have heard of this great doctor, despite him having won the Nobel Prize for medicine in an era when the Nobel Prize actually meant something incredible. The secret to beating cancer is that life-giving breath of God: oxygen. Technically, it is not so simple but it is almost that simple. The real trick is getting the oxygen into the deep tissue cells, and getting the cells to ‘eat’ it again. Dr. Budwig’s regimen is just one of many for stimulating this. Most cancer cures (not treatments) involve adjusting the body’s pH beyond neutral, and into an alkaline state. 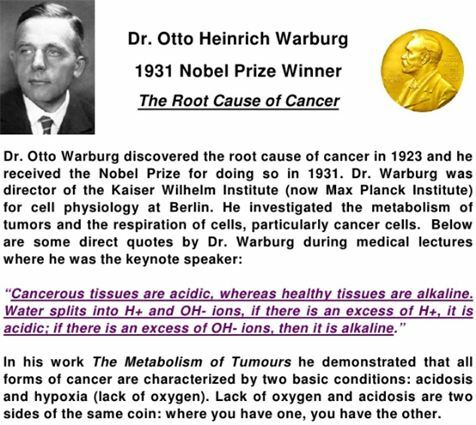 In the alkaline state, human blood is especially rich in oxygen, and this same oxygen is poisonous to mutated cancer cells. Oxygen is, of course, harmless to people who are eating a healthy diet full of anti-oxidants. Whilst mocked by the cancer industry, the generalized anti-cancer alkalizing protocols have varying degrees of effectiveness, and merit further inspection. Dr. Budwig found ways to oxygenate patients better and faster than other therapies. Her results were catapulted past those of other alternative therapies by utilizing a solution made from common flax seed oil and quark cheese. She discovered that the so-called “healthy” (fat free) diets were a huge part of the problem. Her regimen eliminated damaging fats and foods from the diet that cause cellular oxygen starvation, and replaced them with healing foods, and life-saving essential fatty acids. Along with diet, she emphasized the benefits of sunlight, the natural source of the anti-cancer vitamin D3, and the elimination of personal issues for stress reduction. When Johanna was promoting omega-3 supplementation, it was a new and novel concept. The mainstream establishment berated her theories and research papers about the omega oils. Mainstream promotion of the need for omega-3 only occurred decades later, toward the end of her life. She has now been vindicated, and that area of her research is now well-established. There are two stages of the Budwig Protocol. One of them is a natural medicine, which is a blend of something containing high amounts of sulfur proteins, and flax seed oil to provide safe omega-3 in appropriate levels. Fish oil is avoided because there is a high risk of impurities, it requires heavy industrial processing, and it will dangerously upset the balance of the omega oils further. Fish oil is almost always rancid by the time it reaches retailers, which means that it is actually carcinogenic. Dr. Budwig discovered that the body will synthesize omega-3 from flax seed oil in the exact quantity that it needs, and in the proper ratio with other omega oils. This food-based medicine is normally taken orally, but in the most terminal cases, Dr. Budwig was also known to have given pure flax seed oil in enema form. The other stage of the Budwig Protocol is the special diet. Dramatic results are usually seen within 90 days, and sometimes within a week. Patients should continue the regimen for a minimum of 6 months, regardless of a lack of symptoms. The primary medicine is mixed together, and taken orally once a day at bare minimum. It should be stirred with a wooden or plastic spoon. Wood is ideal, and metal should never be used. 1 cup pure quark cheese. Make sure that it is not made with homogenized milk. Since quark cheese is not available for most people, see our suggestions below for alternatives. 2-5 Tbsp. of flax seed oil, or about 10 supplement capsules, or 1-3 Tbsp. of freshly ground flax seed (a coffee grinder works fine and use enough water to make it soft). Note that the flax oil or ground seed must be used immediately after exposure to air. SUGAR IS ABSOLUTELY FORBIDDEN. Grape juice may be added to sweeten any other freshly squeezed juices. Avoid pure animal fats, such as lard, fatback, dripping, and etc. Freshly squeezed vegetable juices are encouraged, especially carrot, celery, apple, and red beet. All natural juice drinks are fine, with special preference to completely organic drinks. Three times daily a warm tea is essential. Good choices are peppermint, rose hips or grape tea. Sweeten them only with honey. One cup of black tea before noon is fine. Most people will need to use alternatives to quark cheese because it is unattainable in most areas. Goat milk cheese is the best alternative for most people. Yogurt, cottage cheese and other soft cheeses are less desirable, because they are made from homogenized milk. These should only be used if goat cheese is not available or it is unaffordable. It is especially important to supplement with vitamin C if a product that is made with homogenized milk is used. The flax seed oil used in the protocol must be protected from air, heat, and light. It should always be cold pressed, and preferably organic. We recommend obtaining it in individually sealed capsules. Avoid fish oil and non-flax sources of omega-3, except for baked fish. Avoid fried fish. We suggest either spring water or water filtered through a Berkey water filter that includes the optional fluoride filters. Green tea with honey and lemon juice. A pinch of cayenne may be helpful, too. Take a large dose of Vitamin C daily that is purchased from a reputable health food store. Do not take more than 5 grams per day, because massive doses will cause kidney stress. This dosage could be problematic for patients with kidney or liver cancers, so use common sense. At least once a day, we suggest our lemon and pineapple drink, because of its ability to improve body pH rapidly. Avoid white bread, white rice, white sugar, white salt, white flour, and anything else that is bleached with chlorine compounds. Avoid “table” salt and get high quality unbleached sea salt from a health food store. Delay detoxifying when a person is severely ill or unstable. Get a high grade water filter for shower water with the priority of getting all chlorine removed. Do not use tap water in a vaporizer, because it will release chlorine gas. Find safer alternatives to common soaps, bleaches, and detergents at health food stores. Eliminate candida, which should already happen with the Budwig Protocol. Avoid your doctor. Seriously. This could be the most important rule if you want to live. Avoid soy products and canola oil. Use iodine transdermally, but beware of povidone iodine. If a pill form is necessary, then supplement only with red marine algae capsules. Do not use any other type of oral supplementation for iodine. Take a teaspoon of cold pressed organic coconut oil daily. For deathly ill patients, see a specialist, such as a naturopathic doctor (N.D.), who can provide I.V.’s, including safe hydrogen peroxide I.V.’s if necessary. Use Vitamin B-17 for bad cases, but avoid for people with impaired livers. Only three of Johanna’s books have been translated into English. There are six books that are still only available in German. The English books are listed below.